UK, 1988, 95 minutes, Colour. Paul Scofield, Mary Steenburgen, Huub Stapel, Eleanor Bron, Miriam Karlin, Ronald Pickup. The Attic, The Hiding of Anne Frank is yet another film, almost a remake of The Diary of Anne Frank (also remade in the '80s). However, it focuses on Miep Geis, the young woman who was responsible for the hiding of the Franks and the other families in the attic. 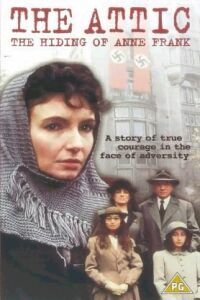 Mary Steenburgen plays Miep most attractively and persuasively, an Austrian Catholic girl living in Holland, who stands up to Nazi pressures and who hides the Jewish families. The film was made for Yorkshire television and has a strong British and Dutch cast, including Paul Scofield as Otto Frank and Eleanor Bron as his wife. The supporting cast includes such veterans as Victor Spinetti and Miriam Karlin. The film was made in Amsterdam and uses the locations excellently and with authenticity. It re-creates the period of the war with some power. Direction is by the American John Erman, director of many telemovies and such films as Stella. A worthy successor to the films about Anne Frank. 1. The popularity of Anne Frank, her story, her diary, an inspiration? This new retelling? 2. Production values: the use of Amsterdam, the re-creation of the period, the Nazis in action? Life in the attic? The musical score? 3. The focus on the Franks and Miep, based on Miep's memoir, the Jews and their experience, the Austrian Catholic, the Dutch and their stances against the Nazis? The mutual influence of the parties, protection and saving? 4. The portrait of Miep: from Austria, at home in Holland, her work in the office, the bonds with the Franks and the others, her refusal to join the fascist group, the pressure on her to return to Austria, her love for her fiance, his proposal and the wedding, her staying at work during the occupation, helping the Franks, the others? Her going to the butcher, the danger in buying the food for those in the attic? Her friendship with Anne, the discussion about movies, life, clothes, growing up? The significance of the diary? The visit to the dentist and hiding him? The official and his threats? The mystery of the betrayal and the family's being taken away? Her love for her husband, their working together? The end of the war, the return of Otto Frank, starting a new life, giving the diary to him, the grief over the deaths? 5. Paul Scofield as Otto Frank, his work, the family, as a Jews, the drama of their registering, his plan for hiding in the attic, life in the attic, his relationship with his wife, daughters? The betrayal, their being taken in the trucks? His return and his explanation of the deaths? 6. Anna and Margot: ordinary young girls, The Philadelphia Story, talk about Cary Grant, going to ping-pong? The change in their lives, the Jewish registration and photos, fingerprints, etc? The writing of the diary? Being taken, immortalised by the diary? 7. The Van Dans, their work, in the attic, hiding, the happiness and dancing, their fate? The dentist and his being hidden? 8. The employers and the office, their shielding the Jews, their being imprisoned, released? 9. The fascist woman and her pressure? The Nazi official and his pressurising Miep? The soldiers in the street, their brutality, knocking the Dutch cyclists, etc? Their power, cruelty, the round-ups? 10. The Dutch, the occupation, their resistance? 11. The aftermath of the war? Starting a new life? The plight of the Jews and the Holocaust? The grief? Learning the lessons of history?